What fish do not like a tasty crunchy crustacean morsel like a shrimp? One of the advantage of this shrimp pattern is all the movements it makes. You like? With that thought stuck in my head I have been fly fishing with a shrimp imitation fly of late. And just to give you an idea of how effective it is, on the very first time I tied this fly on the end of my tippet it fooled a fish without me even holding the rod! After some not-so-pretty-looking false casts (I need more practice) the shrimp finally landed maybe 40 feet away, I put the rod down while I rummaged through my fishing pouch and think it is probably a good idea to let the fly sink anyway. The next thing I know is seeing the fly rod buckle back and forth. Had it been a bigger fish my rod could have taken a dive over the railing it was resting on. After a brief tussle I reeled in a feisty little Peacock Bass. I was feeling a little stressed from my day job the other day and decided to grab my fly gear for a quickie at a nearby lake in the morning. After dropping of my missus I was at the lake edge in no time. Fishing to me is therapeutic. Just an hour or so casting and my mind is cleared and refreshed. You should try it sometime. Just don’t expect to catch something every single time. Enjoy the moment. Out went the shrimp fly again that morning and a Pacu took it with zest. The way it was fished was to allow the fly to sink to the bottom and then strip-strip-pause-strip-strip-strip-pause. Repeat till you feel a strong tug. Simple. The line used this time is the Rio Avid Intermediate Clear attached to 8 pound leader. Fly fishing is fun! Your turn to share your shrimp fishing experience. Perfect hook-up on the corner of the mouth. 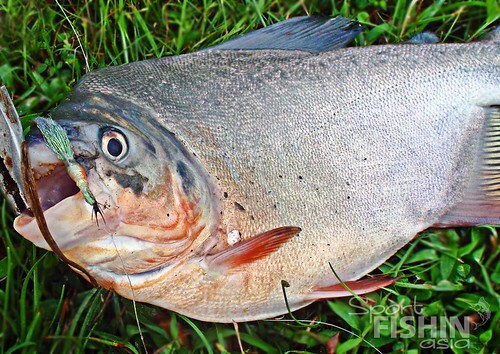 Had the Pacu swallowed the fly it would have instantly severed the tippet line. Did you tie these yourself, or are you able to buy them in KL..or mail order? If they can be mail ordered, I would be interested in getting some here because they would probably be perfect for little Indo-Pacific tarpon. No Chris, I’m still learning but I can send you some, no trouble at all. I’ll write you an email so that you can let me know where to send them to. Frogfish will change the way he fish if he catches any snakeheads with it. Did someone order a snakehead on the fly? Coming right up! Haha I remember that first photo with the PB! Hehe, thanks cameraman! Oh ya, your package arrived today. Korp khun mark krup! So many fish to catch, so little time! !